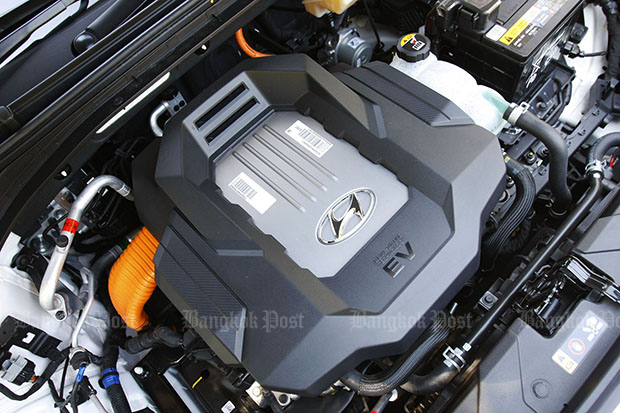 Despite being successful in many global markets, Hyundai isn’t having an exactly easy time in Thailand where the Japanese car players have exerted their dominance for decades. Family cars like the Sonata sedan and Tucson SUV only came in small numbers due to extra-tight margins caused by high import duties. 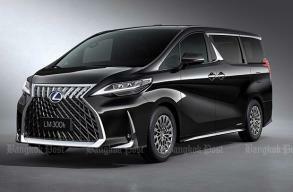 Probably the only model that is keeping the Korean brand alive in the country is the H1 (and its luxurious Starex sibling) van thanks to some loopholes in custom and excise taxation. 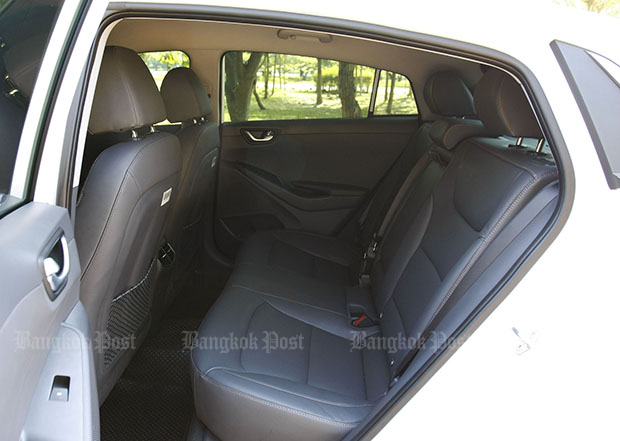 That explains the 1.3 million baht starting price of this people-carrying shebang, which is to say that Hyundai is perhaps resting its laurels on something relatively draconian (the H1 is a commercial vehicle after all). Yet, there’s one product that has popped up again on the radar screen of the Thai Hyundai office last year. And it’s quite an interesting one because the so-badged Ioniq has been developed as a global C-segment hatchback with three different types of electrified powertrains: hybrid, a plug-in version of it and all-electric variant. Naturally, Hyundai overlooked the hybrid option because it would have to compete with the bigger, Thai-made Honda Accord and Toyota Camry hybrids in price. The plug-in hybrid could have taken the Ioniq a step ahead of its Japanese competition. As well, this particular model suits a country that has almost no recharging infrastructure in sight yet. However, Hyundai decided to forego those options and jumped straight to the all-electric one called Ioniq Electric. No, the Korean maker hasn’t applied for local privileges given out to makers who build electrified vehicles in Thailand. Worse, import duties for EVs remain just as high as those applied on conventionally powered cars. Which is safe to assume that Hyundai is only selling the Ioniq Electric for the kicks here. Priced at 1.749 million baht, this zero-emission car still isn’t one for the masses. Just under 15 units of the Ioniq Electric were sold last year. Should you be roused by the Ioniq Electric at such a price level? Well, if you’re looking for a battery electric vehicle from a globally recognised brand with the cheapest price, look no further. The only other two BEVs (excluding tarted-up golf carts) in the mass-market scene so far is the Nissan Leaf and Soul EV from sister-brand Kia. 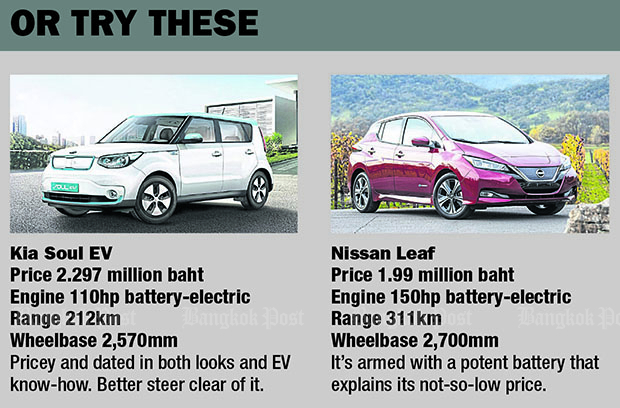 The Soul EV must be a sales flop because its two million baht-plus price attracted only two buyers, while the Leaf was only launched last month at 1.99 million baht. There’s a reason why the Leaf is more than 200k dearer than the Ioniq Electric. 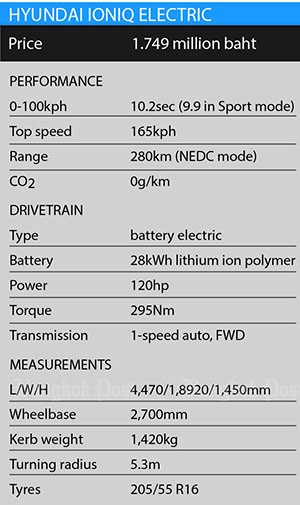 While the Nissan comes with latest battery tech with near-400km (under the old NEDC regime and not the latest WLTP) of claimed range, the Hyundai employs an older version with a lower 280km record. Of course, Hyundai isn’t behind the EV tech race because its most recent Kona Electric, previewed at the Motor Expo late last year, has a better battery pack than the Ioniq Electric. 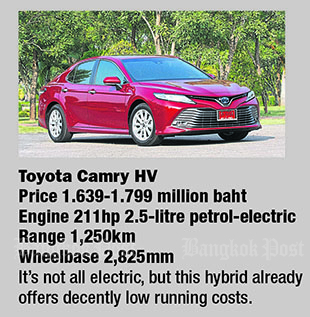 That’s why the Kona Electric is slated to nudge two million baht in price despite its smaller package. That said, there’s still a price to pay for range due to cost of new tech. But if you’re happy with what the Ioniq Electric can do, this particular choice works quite well. Like how we experienced with plug-in hybrids in European cars on Thai urban roads, you’d probably attain around 60% of the range Hyundai claims. The charging time from empty via the conventional wall socket is some 12hr. Performance-wise, the Ioniq Electric is so-so more than impressive. Developing a meagre 120hp, the electric motor sometimes feel a little lazy. 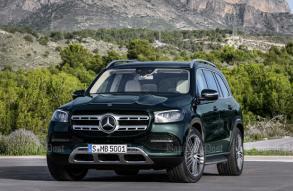 You can make it livelier and pull stronger when engaging the Sport mode of the drive selector, but coming along with it is a heavier steering. It would have been nice if they can be adjusted separately. 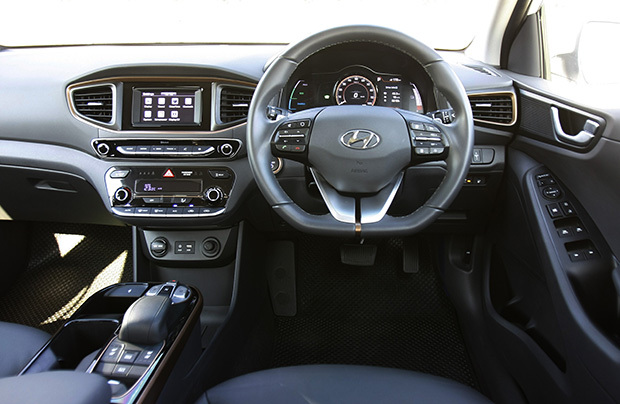 A nice feature, though, is the ability to adjust brake retardation in three steps via the use of steering-mounted paddle-shifters usually reserved for combustion-engined cars with several forward ratios. Using this system not only increases energy regeneration from the brakes but helps for an easier driving experience whereby the car can decelerate (by engine-braking) upon throttle lift-off. 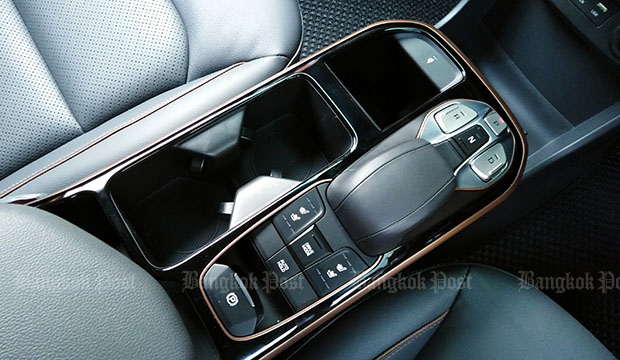 The choice of several settings is better than the fixed “One Pedal” operation in the Leaf. Like in other BEVs, the Ioniq Electric has a single-speed auto. Speaking of this, the Ioniq Electric has an ergonomically friendly gear-button selector (swapping between P, R, N and D) for supercar makers like Aston, Ferrari and Lambo to learn a thing or two about. 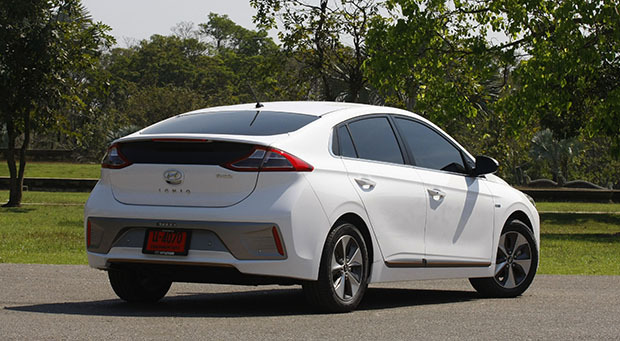 The Ioniq Electric rides quite nicely on Thai roads, although underbody vibrations aren’t totally free. The steering is also nicely tailored on straight roads but becomes a little resistant off-centre in the twisty bits. Even so, the driving characteristics nearly match those of ordinarily powered cars which is something that couldn’t be said for BEVs of the older days. As mentioned in the beginning, the package of the Ioniq Electric basically comes on par with those of compact hatchbacks and, to be more relevant, the Leaf. This means that interior room is just enough, if not good enough to match the likes of the Camry. 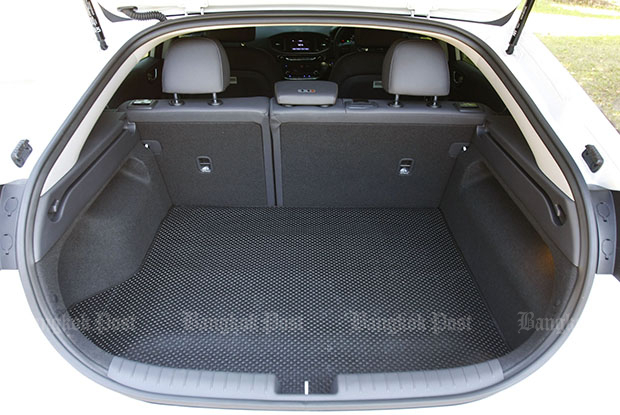 The boot is nicely flat but not so when the rear backrests fold down. Styling isn’t a thing to talk about in the Ioniq Electric, but details like a closed front grille and some copper accents here and there help make the car identifiable on the road. But the rear windscreen is awkwardly designed and hinders vision for the driver. The cabin of the Ioniq Electric works well but doesn’t have the new-age factor. Blimey, even the console screen feels small and obsolete. 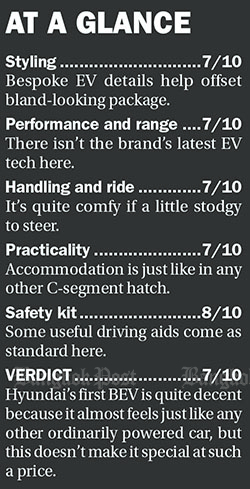 In terms of safety kit, there’s quite a decent list in the Ioniq Electric topped by some driving aids that are now becoming useful on congested roads still filled with erratic drivers. But no matter how well equipped this Hyundai is, it’s still not a car worthy of immediate recommendation. You must be an absolute fan of BEVs because of its relatively high price. Running costs aren’t low either due to vagaries in electricity prices, plus the way and where you choose to recharge the vehicle. 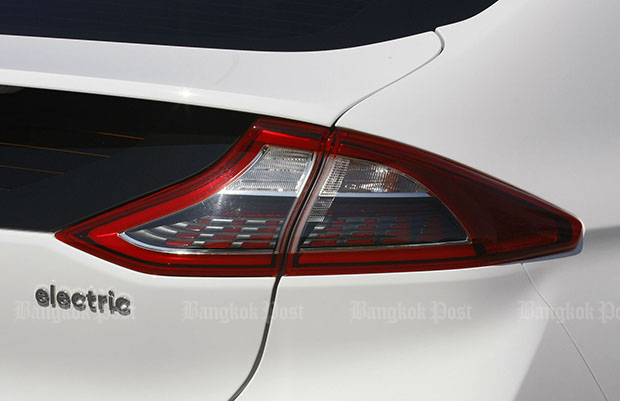 And if you happen to think like many Thais who have yet to be converted with alternative power, the Ioniq Electric is not only trespassing the Camry’s price territory but nearing that of an entry-level luxury brand from Europe. 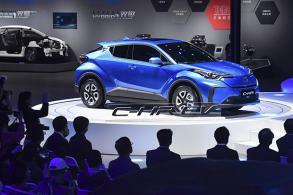 In its own right, there are some things to like about Hyundai’s first BEV. But it doesn’t feel special enough. 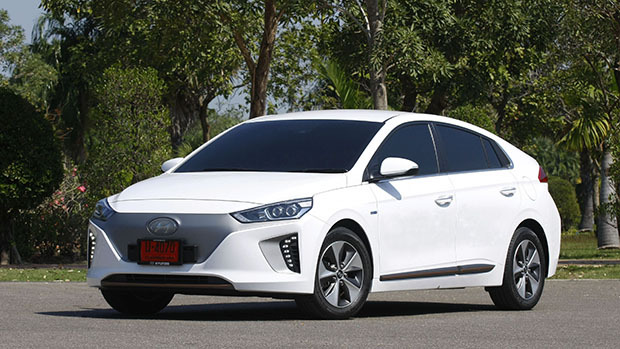 It would have been different if the Ioniq Electric cost a million baht or less.